Here is an example of an applied design thinking project done with a class of 17 students at the University of Hawaii Hilo Upward Bound T³ Alliance during the summer of 2018. Node Red and physical Raspberry Pi setup instructions can be found on this post. Students had mastered the skills associated with basic physical computing and Node Red. They were capable of setting up a button, an LED Ring, using a sonic sensor, a PIR sensor, and a small camera. They had been able to combine all these components using Node Red and were capable of generating emails that sent a photo. I asked around for a person or group at the university that might be interested in a device that could take photos and have them emailed instantly. Eventually I found the perfect potential client in Shara Mahoe, the director of new student services. She was planning a scavenger hunt for the new student orientation day later in the summer when 600 freshmen appear and nervously try to find their way around the large UH Hilo campus. She listened to my description of what the students in our T3alliance program were able to do and how design thinking process worked. Once she understood what was involved, she signed up to be a client. Shara and a colleague showed up in my classroom the next day and I interviewed her in front of the class. She described her day and what she hoped it would feel like to new students. She listed out 5 locations around the University that could use a selfie station and asked my students if they could find a solution that would work. I had previously broken the students up with an ice breaker activity and they now found themselves choosing one of the sites around campus to design a selfie station. 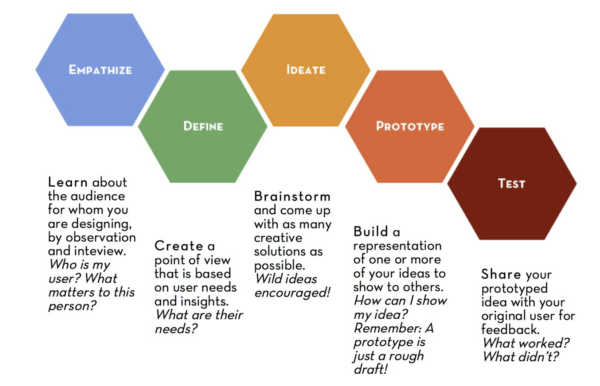 As a team, they discussed what they had heard Shara speak about and filled out the first section of the guide questions associated with the “empathy” stage of the design thinking process. We took a quick walking field trip to each location and the students finished the “define” phase, where they articulated exactly what was needed and what the constraints were, and moved into a brainstorming “ideation” phase. 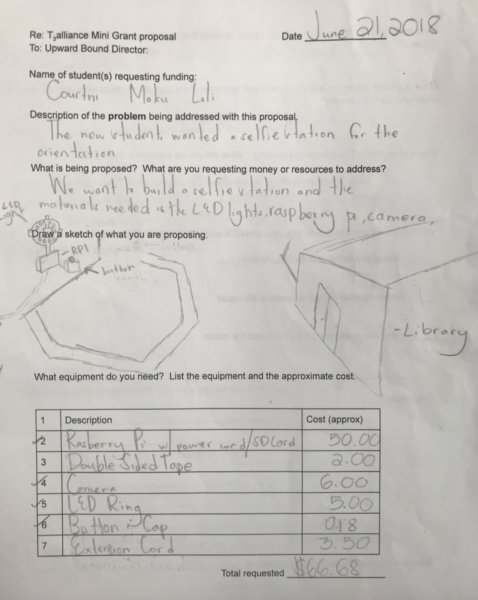 Students were tempted to think there was just one type of solution to the selfie station problem, but they sketched out three different ideas. When this was finished they chose a “prototype” design they wanted to build and they wrote out a mini grant proposal. When the proposal is complete, we submitted it to the Upward Bound director for approval. We prepared ahead for this type of project with wires, and buttons and extra raspberry pi devices with cameras and power supplies. After the proposal was approved we handed out and checked off the items that had been requested on each proposal. The students got right to work building the prototype selfie stations. We instructors restrained ourselves from helping too much and let the teams figure out how to build their designs. When students would ask for help, we would respond with a question. Eventually, the students learned to frame their questions in such a way as to be able to google the answer. We helped in the areas where a skill had not been introduced, such as soldering, or learning to “remote” into the pi. The teams were responsible for building the prototype, writing the code that controlled it, and recording and editing a short video. Several days later, Shara met with us to see the results. The students walked around the campus with her demonstrating the way their selfie stations worked and noting what things could be improved. One team had an opportunity to radically modify their design because it didn’t take into account the safety considerations necessary when a crowd of students would moving past a certain area. The students were beaming when Shara thanked the group. She appreciated their efforts and asked them to sign their work so that new students at the school knew who had built these stations. Each group modified and perfected the design and the instructions. As part of the initial mini grant application, The teams had been responsible for writing user instructions, making a video about the project and writing a short report about the progress of the project. Posted in Camera, Design Thinking, Growth Mindset.